A 1,000-year-old Viking longship is thought to have been discovered under a pub car park on Merseyside. The vessel is believed to lie beneath 6ft to 10ft (2m to 3m) of clay by the Railway Inn in Meols, Wirral, where Vikings are known to have settled. Experts believe the ship could be one of Britain's most significant archaeological finds. Professor Stephen Harding, of the University of Nottingham, is now seeking funds to pay for an excavation. 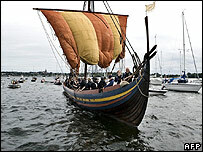 The Viking expert used ground penetrating radar (GPR) equipment to pinpoint the ship's whereabouts. He believes the vessel could be carefully removed and exhibited in a museum. Professor Harding said: "The next stage is the big one. Using the GPR technique only cost £450, but we have to think carefully about what to do next. "Although we still don't know what sort of vessel it is, it's very old for sure and its Nordic clinker design, position and location suggests it may be a transport vessel from the Viking settlement period if not long afterwards. "Scandinavian influence persisted here through the centuries. It is speculation at the moment, but at least we now know exactly where to look to find out. How it got there is also hard to say. It is some distance from the present coastline and probably the old one too. It might have got to its present position after flooding and sinking into an old marsh or its likely that a couple of local scallies robbed it and buried it under the carpark until the heat died down." The ship was first uncovered in 1938 when the Railway Inn was being knocked down and rebuilt further from the road, the site of the old pub being made into a car park. Workers were advised by the foreman to cover the ship over again so as not to delay construction. There's a nice edit in there!